Mountain Adventures Snowmobile Rentals operates 7 days a week, November – May (Weather & Snow Permitting) including Holidays. All Rates include helmets and 20 minutes of instruction and are for unguided riding. 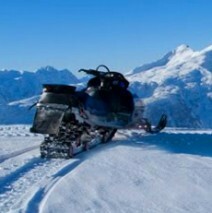 Fuel is additional, one tank of gas can last 4 to 8 hours depending upon snow conditions and riding style. Warm under-layer, gloves, Jacket, Waterproof pants and Boots are recommended. Rental includes Trailer and Helmet(s), pick up and return to Medford. Delivery available only to private property (no Forest Service Property, etc) for an additional fee. It can be unsafe to take 1 snowmobile only. Any motorized vehicle can have a failure and accidents may occur. Nobody wants to be out on the trail alone!